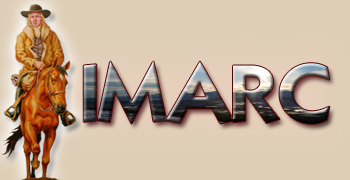 IMARC is an Inter-Denominational Methodist page. It is here to provide a real world view of Biblical Christianity form a Methodist perspective. Our resources have grown since we first enter the world wide web in 1995. It has been a blessing to many since its founding. We would like to invite you to enjoy the materials that we have available for you. You can trust your soul with the information provided on this page. We are Methodist/Wesleyan Arminian, and we make no bones about it. We are here to serve the Bible Believing family of Wesley and particularly Christ our Lord. Since prophecy seems to be so important, IMARC believes that our Lord will return bodily/physically when he decides so to do. We do not profess any particular view on prophecy except for the above. Yet there are writers who have written on IMARC who do express their views. Please chose from the topics listed in the box below. Contact IMARC for more information about this page. New Faith Alone, Grace Plus Nothing, and the Schoolmaster. Yep! They Fianlly Figured it Out - The Four Blood Moons. Classical and Reformed Arminianism vs Wesleyan Arminianism. New sermon Gods Truth Marches On! New Sermon Don't Blame DNA! Articles by friends of IMARC which link directly to their web site. Enjoy. What I am about to write will reveal my heart and my mind on the matter before us. We live in an age where there is plenty of latitudinarianism exists under the umbrella, which is called "Arminianism." Arminianism has always allowed a great deal of latitude, but has suffered when the boundaries of what is "Arminian" has not been defended and defined. Open Theology is not new. It is an old idea dressed in a new suit of clothes. Some of the core tenets promoted by Open Theists were expressed by Socinus in the 16th Century. Church history identifies him as a heretic whom Wesley opposed. Like Wesley, we must recognize that alterations to the doctrine of God, no matter how insignificant they may appear, can have profound ramifications upon the entire matrix of one's belief system. All credible theologians believe that the doctrine of God is the fountainhead from which all other truth flows. James Leonard, "Why I'm an Arminian and Why Calvinism Is Dominating the Evangelical Book Market"
Calvinists, on the other hand, think that God regenerates you in order that you can then believe. For them, regeneration makes it possible to believe. In effect, for Calvinists, a person has the new life of Christ prior to faith. I also think that union with Christ requires on-going faith, and not some past tense faith. That is to say, just because I believed in Christ back in 1967 does not guarantee that I will continue in faith. In fact, scripture repeatedly emphasizes that believers must persist in faith, and issues the direst consequences against those who make shipwreck of their faith. Faith Alone, Grace Plus Nothing, and the Schoolmaster. Now before we go farther, let me pause here to add another aspect to this discourse. What I will say has nothing to do with modern theology. Nor do I take aim at liberal theology. No! I am speaking of conservative theology and mainly the two systems of theology that have divided American Christianity and even the world wide Church. That is, Calvinism and Arminianism. Now I am on the Arminian side of this issue and I have no problem with the Wesleyan Arminian position. But after admitting this however, there is a larger point to be made with both views. Before the turn of the twentieth century both groups understood the problem of sin within the Christian body. Both preached against living in sin and the fact that in some sense of the word, victory could be had over it completely. In short, for them, the idea of a "sinning saint"� would have been a terrible heresy. Today the Calvinists teach that it is "grace plus nothing and you are saved. "� The Arminian position teaches it is "faith plus nothing and you are saved. "� In the process of teaching our twist on truth, we discover we are wrong because Paul says we are saved "by grace through faith ... and it is a gift of God. "� We before seem to ignore that it takes both grace and faith to save us. In our generation we seem content to stop at either grace or faith in the work of salvation. But Paul adds that we are to "work out our own salvation with fear and trembling. "� And James no less supports this idea by saying, you know, I will show you a man's faith by his works. Works, while they cannot save, are certainly important no matter how you cut it. The great mistake of the modern American Church is that somehow, when a person becomes born again, that magically we know what is right and wrong, and therefore we need not worry about the "do's"� and "dont's"� of the faith. Sadly many American missionaries are propagating this concept throughout the world. "To candid, reasonable men, I am not afraid to lay open what have been the inmost thoughts of my heart. I have thought, I am a creature of a day, passing through life, as an arrow through the air. I am a spirit come from God, and returning to God: just hovering over the great gulf; till a few moments hence, I am no more seen! I drop into an unchangeable eternity! I want to know one thing, the way to heaven: how to land safe on that happy shore. God himself has condescended to teach the way; for this very end he came from heaven. He has written it down in a book! Oh, give me that book! At any price, give me the book of God! I have it: here is knowledge enough for me. Let me be homo unius libri: "A man of one book." Here then I am far from the busy ways of men. I sit down alone: only God is here. In his presence I open, I read this book; for this end, to find the way to heaven. Is there a doubt concerning the meaning of what I read? Does anything appear dark or intricate? I lift up my heart to the Father of lights. Lord, is it not your word, "If any man lack wisdom, let him ask of God"? You "give liberally and upbraid not." You have said, "If any be willing to do my will, he shall know." I am willing to do: let me know your will. I then search after, and consider parallel passages to scripture, "comparing spiritual things with spiritual." I meditate thereon, with all the attention and earnestness of which my mind is capable. If any doubt still remains, I consult those who are experienced in the things of God; and then, the writings whereby, being dead, they speak. And what I thus learn, that I teach." Brother Gao Zhisheng, We Love You and are Praying for You. 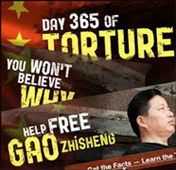 IMARC is still watching for word about Brother Gao, and praying for his family and for a Free China. Read his wife's, Liu Xiaodong, appeal for help. (Beijing�April 21, 2013) The wife of Christian and longtime political dissident Zhao Changqing has issued an appeal for help after he was taken into police custody, apparently because he had called for government officials to disclose information about their financial assets. Recently I have respond to "The United Methodist Reporter," an online journal, and the article below is in response to the above named article. The editors evidently felt that my response was unnecessarily to critical. Therefore, they did not post it. I thought it somewhat strange how the United Methodists will stoop to anything to get their churches to grow. Immersion has become the panacea for modern churches, no matter the strip or color, "demonstrating" that somehow they scribe to Biblical Christianity. So what's in the water? The Bible is the inerrant word of God and the rule for the lives of Christians. If God does change the rules -- as He has the authority to do and in a few instances such as swearing did -- He states it explicitly. If He didn't explicitly change the rules, they haven't been changed. Therefore the teachings on divorce and remarriage found in various parts of the Bible are complementary, intended to be understood as a logical whole, not one set replacing another.